I have 3 wishes. 1) to have a one woman show of all my art work 2) write a book of kids art projects based on my Mundo Lindo program 3) teach and travel with my husband (like the teaching trips I have planned at Montecito and Orvieto). There, now the universe knows! 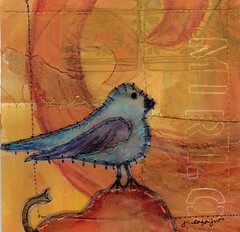 This 3rd bird on a pear is on woven watercolor paper, painted and stitched and the image is a gel skin transfer, also stitched. It's about 5x5"
Oh, the universe already knew, but when you dare to embrace your wishes, things happen! ;-) I would love to read that book. You ARE going to Orvieto. And I can't believe you haven't had a dozen one-woman shows. Truly. This is a no brainer. Maybe you will get inspiration from the day care at the convent in Orvieto for your book. Andiamo! Funny how when we write about our dreams and aspirations, they turn into realities. I journaled for awhile earlier this year and wrote a lot about things I wanted to do, and dang if I'm not doing them! I hope all your wishes do come true! Hope that all of your wishes do come true, and would love, love, love to be there for numero tres!